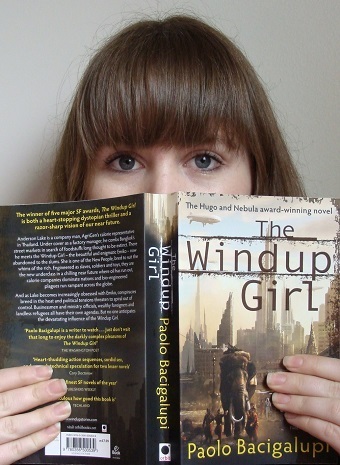 ‘The Windup Girl‘ is one of the most genuinely frightening dystopian novels I have ever read. While many dystopias are frightening for their sometimes bizarre abstraction from our current reality, or huge disasters or cataclysmic events leading to dramatic change, ‘Windup Girl’ frightened me as it was (in my opinion anyway) based on a quite plausible premise; human expansion reaches it’s peak when oil reserves are depleted fully, resulting in conflict over food production, consumption and distribution. Bacigalupi imagines this to be followed by aggressive, competitive, genetic engineering of food for maximum ‘calories’ by huge transnational (but particularly American) corporations, referred to as ‘genehacking’. Apparently there is a whole genre of this kind of dystopia, it is referred to as ‘biopunk’ and I am definitely looking forward to exploring it a lot more! The novel is set in Thailand in the 23rd Century and only alludes to the conditions of people in other parts of the world. The setting is beautifully realised, tying together elements of the current Thai system, such as the royal family and traditional religious/cultural practices, with some ‘futuristic’ elements such as the use of genetically altered Elephant-like creatures to generate power. One thing which I found a bit irritating about the book was the use of various Thai, Chinese and Japanese words. While it is not a prominent as in ‘A Clockwork Orange‘ for example, I did find it difficult to remember the meanings of some of the Thai words. This is probably a personal preference, as the Thai/Chinese/Japanese terms do add colour to the language, and help to differentiate between how various characters see the world. I was not immediately drawn into the narrative of ‘The Windup Girl’, and could not see why one of the minor characters gave the book its title. However, as the novel progressed the characters began to interlink and the main thrust of the narrative became clearer, culminating in one of the most breath-taking climaxes I have read in a long time. I had to take breaks from reading between the last 4 or 5 chapters so that I could fully digest the complexities of the unfolding situations. That ‘The Windup Girl’ is a debut novel was a complete surprise to me, as it was written with such finesse. I can see why it is so highly praised and won both the prestigious Hugo and Nebula awards for Science-Fiction writing. I am definitely going to be watching out for more novels by Bacigalupi, and intend to track down some of his short stories as soon as possible. If you are interested in other dystopian novels I have read and recommend, then have a read of my review for ‘A Brave New World‘. But remember that ‘The Windup Girl’ is now at the top of my list of dystopian favourites. ‘Cold Spring Harbor’ – Richard Yates 1986.